The much sought-after zigzag pattern can be found either in staggered rows of honeycombs (blue and purple) or four-limbed stars surrounding a central point of four graphene honeycombs (red, green). 30-Jan-2019: Graphene is a promising material for use in nanoelectronics. 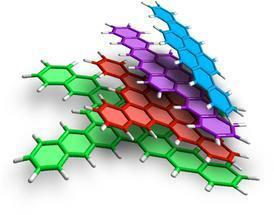 Its electronic properties depend greatly, however, on how the edges of the carbon layer are formed. Zigzag patterns are particularly interesting in this respect, but until now it has been virtually impossible to create edges with a pattern like this. Chemists and physicists at Friedrich-Alexander-Universität Erlangen-Nürnberg (FAU) have now succeeded in producing stable nanographene with a zigzag edge. Not only that, the method they used was even comparatively simple. Dominik Lungerich et al. ; "Dehydrative π-extension to nanographenes with zig-zag edges"; Nature Communications; Volume 9, Article number: 4756 (2018).